Since my last post was all about 2013 wedding food trends, it only makes sense for this post to be about the wedding drink trends of 2013! 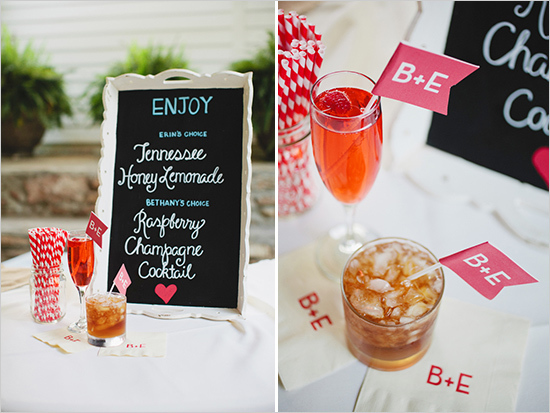 Deciding what to put on the drink menu at your wedding should be a fun and stress-free time! Be creative! Dare to be different! I can’t stress it enough! Guests will see the personality and effort put into creating the perfect drink menu and will enjoy their time at the reception that much more. Weddings are always getting reinvented and couples are looking for more and more unique wedding elements; everything down to having a memorable bar experience for guests. What’s a better way to start getting ideas flowing than sharing what’s happening with the top 2013 wedding drink trends! 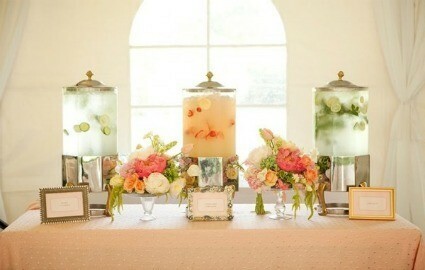 Finding its way into the 2013 wedding drink trends are champagne bars, more commonly referred to as bubbly bars. Bubbly bars are such an easy and elegant way to give guests a personalized bar option and let them do the choosing. 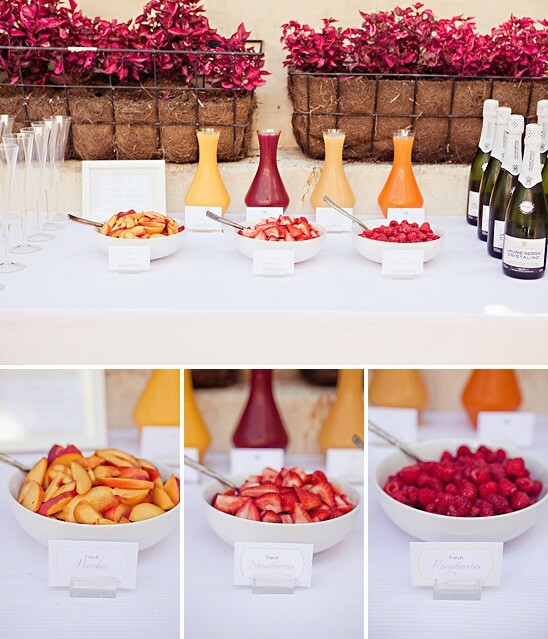 Beyond providing champagne, also offer up juices like pineapple, cranberry and orange juice. Then set out bowls filled with fresh fruit: peaches, grapes, raspberries and blackberries for garnishes and a little extra flavor. Your guests can pick whatever they like and enjoy their very own custom-made cocktail. They’ll have fun trying different concoctions and will keep going back for more throughout the night. There’s no surprise why this made the list for top wedding drink trends: anything that’s DIY for guests is really in right now especially when it comes to what they are drinking because of personal preference. Everyone wins! Bride and groom drinks also work to personalize the bar experience for guests and has been a longstanding wedding drink trend. Some tips to having the perfect his and hers drinks: make sure your specialty cocktails reflect the bride and groom and is something that guests will enjoy drinking. Don’t give guests too many specialty cocktail options in fear of the overwhelmed feeling. Stick to one or two to have the best effect and to make it really come across as special. Also, having a bar menu showing guests their options will make them feel at ease when deciding which drinks are available. These hot drink stations are one of my favorites! It seems like the options here are limitless! 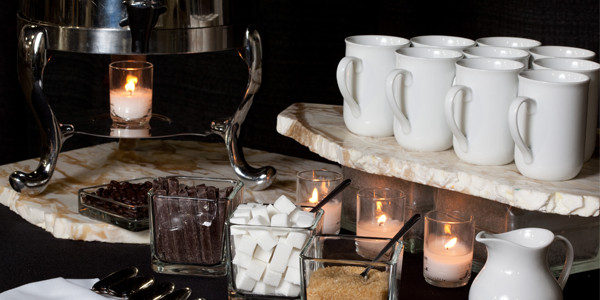 What’s great about this 2013 wedding drink trend is that it comes in so many forms: coffee bars, espresso bars, hot chocolate bars, and hot cider bars. Don’t be afraid to step outside the box when it comes to toppings, flavors, and setups. Cute additives to be sure to provide are a variety of creamers, syrups, marshmallows, caramels, peppermint sticks, and some other yummy toppings that guests will view as one of a kind. Especially consider this option should your outdoor wedding be in the non-summer months, where the evenings may get chilly once the sun goes down. Keeping guests with a warm drink in their hand will ensure they have a good time, and tend to stay longer into the reception. Being that Michigan is known for their countless wine stops along the wine trails, it only makes sense to have local wines be the star of the bar! Since tons of our couples are from out of town and planning a destination wedding, they tend to focus their wine selections on local offerings. Having a wine tasting option for guests is the latest one-of-a-kind wedding drink trend. Most popularly found during cocktail hour, it’s a great way for guests to try something new and exciting. It’s a special occasion and the bar should speak to that! Whether setup station-style or just an add-on of the bar, consider adding infused water to your drink menu. Drinks don’t always need to be focused on the alcoholic beverages served at the reception. Consider adding in a small touch of something else – an infused water station filled with a punch of flavors! These infused waters are always such a refreshing thing to drink – especially on a beautiful summer day at an outdoor wedding. Dress it up with water dispensers that fit your wedding style as well as framed description cards listing what each water is infused with. Something as small as this really goes the extra mile in making your reception that much more unique. Hope you dare to be a little different and try something new for your drink menu and bar atmosphere! Don’t play it safe – get creative – get your bartender involved! They have so much expertise and unlimited knowledge: utilize it!